A VIP guest officially opens our new London HQ! If moving into our new offices wasn’t exciting enough, today we welcomed the Minister for Digital and Culture, Matt Hancock, to officially open our London HQ. 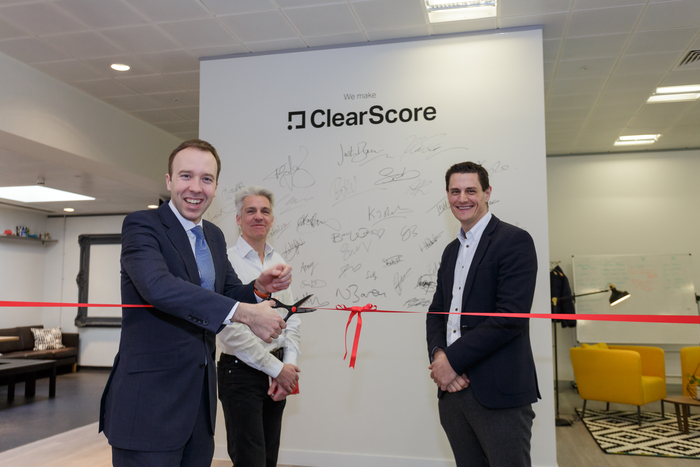 Cutting the ribbon with Justin Basini, our CEO and co-founder, and Dan Cobley, managing partner, FinTech at Blenheim Chalcot, Hancock spoke about ClearScore’s contribution to the UK’s digital economy. He said, “ClearScore is a great example of the young companies driving forward our booming digital economy, which is already worth more than £118bn a year and growing twice as fast as the rest of the economy. The official opening of our office comes soon after we were named in the Future Fifty, a group of businesses judged to be some of the fastest growing, most disruptive digital tech companies in the UK. Our office is starting to feel like home already, and we’ve got plenty of space for new starters to come and join the team. If you’re interested in joining us and being a part of our story, head over to our careers page.